by Shannon Clark in Save on Groceries | 6 comments | Contains affiliate links. 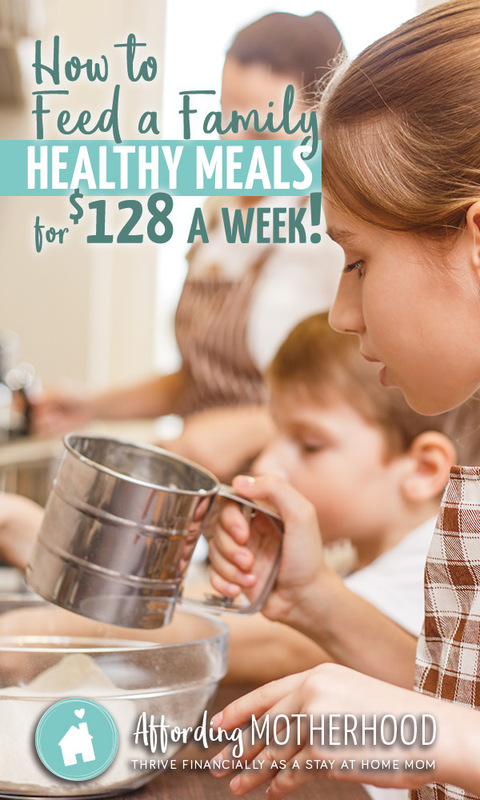 Want to purchase healthy food for your family on a tight budget? Be sure to download your free printable and take this budget grocery list along next time you go grocery shopping. According to the USDA, the average grocery bill for a family of four with two young children should be only $128 per week on a “thrifty budget”. But what does this tight grocery budget get you? Is it even possible to purchase healthy foods for such a small amount? The following is a budget grocery list for a family of four, with two young children, ages 3 and 5 for one week. I chose this because it was the makeup of my own family not too long ago. However, any family on a budget can use the tips and ideas below to save money on groceries without coupons. The serving sizes and balance of food groups are based on the USDA Choose My Plate recommendations. We’ll use this as a baseline for a healthy diet in our experiment because it is the standard for setting the USDA grocery spending guideline. The grocery list is gluten free because trying to eat gluten free on a budget is something a lot of families in this community deal with due to health concerns. The prices used in the frugal grocery list are based on my natural grocery price list and what I can get in my locale without coupons. I’ve noted below where things are natural, organic, pastured, or otherwise better than ‘conventional’ quality, and as many of these as possible have been included within the $128 budget. For some of you $128 might sound like a lot; for others, it might feel like an unreachable goal. Your family might be budgeting for more or less than 4. Maybe you want to eat more organic or less dairy or more meat. The exact number isn’t the point. As you read through, try to look for the patterns of what types of foods can fit into a healthy budget grocery list. See which tips you could apply to your family, and modify the meal plan and shopping list as needed. When shopping for fruit, opt lower priced foods like apples, bananas, and oranges and in-season produce. As with fruit, try to plan your meals around lower priced vegetables like carrots, onions, celery, and potatoes and in-season selections. Also, when following a recipe, don’t be afraid to substitute more expensive veggies for cheaper ones, depending on what’s available when you’re shopping. If you want to incorporate some organic veggies, buying frozen in bulk is your best bet. You can find a lot of organic food is available at Costco (both fresh and frozen). Shop in bulk for dry goods as much as possible, and that helps keep prices down a lot. You can keep meat costs down by buying larger quantities and freezing. Canned salmon is a good way to get some Omega-3s into your family’s diet on a tight budget. Occasionally, opt for eggs or beans to stretch meat dishes or plan a vegetarian meal. For my family at least, the USDA recommendation seems to be a crazy high amount of dairy. However, we’ll stick with their guidelines for this experiment. If you’re able to increase your budget from the baseline of $128 per week, I would use the extra funds to improve the quality of dairy you buy. The grocery list price does include the cost of everything you’d need to cook meals for the week, right down to the spices. In most cases, you need only a tiny bit, so you’d use this amount to restock your pantry as needed. However, if you want a jumping off point to get started using this budget grocery list, I won’t leave you hanging. Here’s a one-week meal plan complete with recipes and prep notes. It’s designed to ensure you use up left overs without getting bored of eating the same foods. I have also planned it out so you can cut down on meal prep and batch cook as much as possible. Chicken tacos with avocado, tomato, cheddar, lettuce, brown rice, and beans. Soak red beans overnight for tomorrow’s dinner. 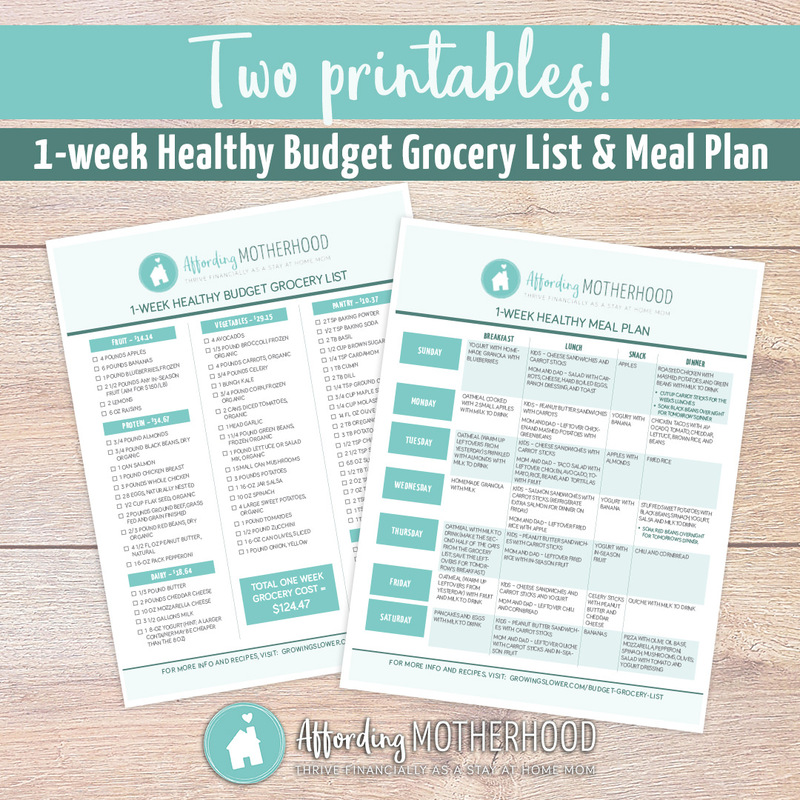 Download your healthy budget grocery list and meal plan free printable. How Much Can You Cut Your Grocery Budget? Can you spend less than this? I’ve seen meal plans from moms who feed larger families on much less. I will never judge another mom for what she chooses to feed her family or for the tiny budget she has to work with. I’ve been there and been criticized for it. By the grace of God, we were able to pay off our $22,000 in debt in 9 months in part thanks to learning how to eat healthy on a tight budget. Although it’s not perfect, the list above gives a healthy balanced diet on a tight budget. It includes fresh fruit and vegetables and the best quality food that this budget will allow. The list is full of healthy real foods, not processed junk. Best of all, no coupons are required to stick to this budget. This also doesn’t include additional grocery savings strategies like planting a garden. I would love to walk you through creating your own grocery savings system that works for your family – without clipping coupons. Check out my popular course Grocery Savings Made Simple. it would have been more helpful if you had put the size of the package you bought. For example you have 1/3 a pound of froz. broccoli and 1/2 pound of cornmeal. I have never seen 1/3lb of frozen broccoli for sale, so did you buy an 1 1lb package and estimate the cost of 1/3 of a lb. Also, I have never seen 1/2lb package of cornbread for sale, so did you estimate the cost of 1/2lb and that is in your total cost. The same goes for the spices/pantry items. I don’t know where you can buy tablespoons of anything. I would have liked to have seen the prices of each item individually. However, I do appreciate your time and trouble to do this. Yes I do most of my shopping in bulk, so I buy however much is reasonable and then would save the rest for future weeks. In the bulk section of many stores, you can buy small amounts of spices and dry goods if that works better for you. I think that’s a great idea, I will try to add in the individual prices soon. Thanks for the suggestion! This is incredible, Shannon! Thank you for putting this together. On another note: I got a Costco membership several months back, but am still trying to figure out how much I love the store (or not). I have a Walmart and an Aldi closer to me, and I’m just not sure yet if there’s anything I can get at Costco that I can’t get between those other two stores (or for a better price). I guess I could do some detailed analysis, but am not sure yet. And sometimes when I buy veggies in bulk from Costco, some go bad before we use them – that’s not a good value, of course! My grocery budget is a constant source of frustration to me. My family is almost identical to your hypothetical family, yet we spend far more than that. Looking over the menu I can see part of it is that we just eat more. My husband is a very high metabolism, super thin, guy who eats a lot. my 4yo son likely has Celiac disease and eats more than anyone I know. Oatmeal is just one of the courses he needs for breakfast. We’ve been instructed to let him eat because he needs the nutrition. I know most kids could always eat more, but I feel like I’m feeding a family of adults and it’s killing me. Do you have any other weekly meal plans or just this one? Thank you. I just have this one example Jacki. I do run a grocery savings course that helps you create a ‘set it and forget it’ type meal plan.